Helping Minnesotans achieve sustainable homeownership for more than 20 years. Buying a Home Get started on the path to owning your own home. Homeowners Faced with a big repair cost? Worried about mortgage payments? Learn about your options. Partner Resources Education and resources for those serving the homeownership industry. 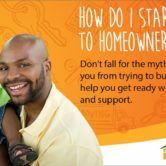 The nonprofit Minnesota Homeownership Center is your free connection to unbiased information, education and advice relating to all aspects of homeownership. We help potential home buyers like you make smart decisions. The Minnesota Homeownership Center offers unbiased advice, homebuyer education classes and connections to programs and resources that meet your unique individual needs. We connect you with resources that can help you keep your home. We know that owning your own home is important to you. It’s important to us too. The Minnesota Homeownership Center offers connections to foreclosure advisors, refinance and reverse mortgage advisors and more. Together, we’re making a difference! We’re proud to work with organizations promoting and advancing successful homeownership across Minnesota’s socioeconomic divides. As a housing coordinator, I use the services offered by the Homeownership Center every day. The Center delivers every time I need help. Simply put, they just plain make my life easier. Spring Is Here! Time for Home Maintenance! The Minnesota Homeownership Center empowers smart homeownership choices through education, research and partnerships grounded in the belief that sustainable homeownership has an essential role to play in fostering diverse, vibrant communities statewide. Use the fields below to start your search.